Monoclonal antibody (mAb)-based therapeutics are emerging as one of the fastest-growing categories of drugs being developed today. In fact, according to a recent analysis,1 the market for mAbs has doubled in the last five years. Much of this growth is due to the emergence of new mAb-derived products, such as antibody-drug conjugates (ADCs) and bispecific antibodies (bsAbs). These new biotherapeutics have a wide range of applications, including applications in cancer treatments and in antiviral treatments for acute and chronic diseases. Essentially, mAbs are multiple copies of the same lab-produced molecule. They work as substitutes for antibodies within the body, binding to antigens on the surface of a cell. By doing this, they can flag cancer cells for the immune system or eliminate infected cells displaying viral antigens on their surface. bsAbs, which constitute a class of newer and more complex mAb-related biotherapeutics, have two mAbs within the same drug to target two types of antigen. As with most therapeutics, mAbs are developed through extensive selection of lead candidates, and the subsequent characterization of their size, shape, stability, activity, potency, developability, behavior in formulation, and other factors. According to Dr. Nemeth, companies need to do characterization earlier and use bigger antibody panels to find that “needle in the haystack”—the result that will lead to a product with the desired characteristics. She explored this idea during her keynote talk at the 10th Annual Bioprocessing Summit, in Boston. There, Dr. Nemeth described how assays are being adapted for high-throughput applications. “If you look back 10 years ago, many assays were lower throughput, accommodating just 2–10 antibodies,” she says, revisiting one of her keynote’s main points. “Now we’re pushing multiple panels of 10s to 100s of antibodies in an assay.” These higher-throughput assays, she adds, have been pushed earlier into the drug discovery process. She gives the example of a high-throughput mass profiling workflow Janssen R&D is developing with Genedata. The companies are using Genedata’s Biologics Refiner® software platform for the batch processing of “intact” mass spectrometry data that accumulate during screens that incorporate sizable antibody panels (10–100 different antibodies). The output consists of the masses identified in each chromatographic peak derived from deconvoluted mass spectra. Other pharmaceutical companies are also looking at automating their mAb characterization processes for higher throughput. For example, at AbbVie, senior scientist Bo Yan, Ph.D., is adamant that mAb characterization needs to integrate high-throughput operations, automation, and a “deep understanding” of critical quality attributes (CQAs). 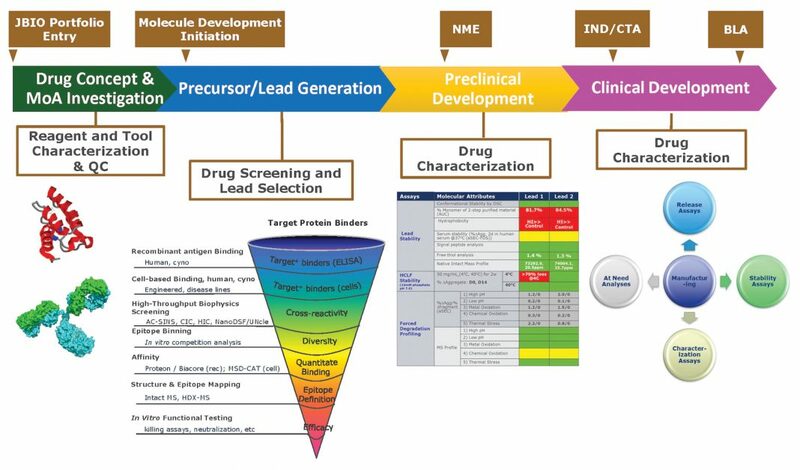 This schematic from Janssen Research & Development shows assay flows for all stages of biopharmaceutical development. The company notes that in early discovery, fast assessments of limited material are necessary. In later development, studies are routine, validated, and robust, and they present minimal material constraints. For ADCs, for example, it’s necessary to characterize all three parts of the therapeutic—the mAb, the linker, and the payload. “You have to characterize the half-life of the mAb, the stability of your linker, how many copies of the payload there are, how stable they are, and—if there’s a toxic payload [such as a cytotoxic small molecule in a chemotherapy drug]—the way those toxins are released,” explains Dr. Yin. He adds that it is necessary to determine if the payload targets only the desired cell type, or if it targets normal, healthy cells, too. In the next few years, the complexity of characterization will become even greater, Dr. Yin predicts. “We are characterizing different modalities,” he states. “But even for the simplest mAb, people are using mAbs for different therapeutic applications.” Different applications require various kinds of characterization, he explains. The focus of mAbs targeted against late-stage cancer, for example, is on improving survival rates, while those selected to treat chronic disease need to have lower toxicity. In general, the growing complexity of characterization means researchers are looking to do more characterization earlier in the drug discovery process. At GenScript, for example, Dr. Yin says that scientists might validate an antibody with more than one animal model, or use several different biochemical, biophysical, in vitro assays, and in vivo assays. Also, if the scientists determine that the antibody doesn’t perform, they might stop the development process and look for alternatives. As a result, Dr. Beckman explains, the process was optimized around the detergent that Dr. Eagle’s colleagues originally picked—and it endured. Unfortunately, some proteins appear to be resistant to being denatured by SDS, making it difficult to isolate impurities. Dr. Beckman decided to experiment with different detergents, and he eventually found that sodium hexadecyl sulfate (SHS) performs better than SDS for some proteins—including some mAbs. “So far, what we’ve found is that some of our thermophilic proteins, really rigid proteins, tend to have resistance to SDS,” Dr. Beckman points out. SHS, he continues, is relatively hydrophobic and hence is better able to overcome this resistance. 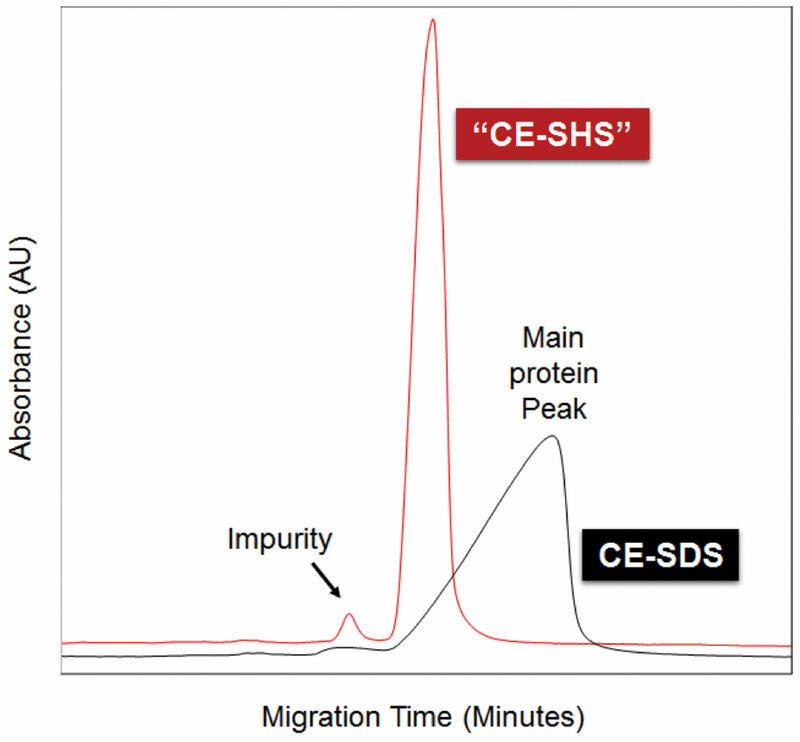 For rigid proteins, CE-SHS gives a clearer separation by molecular weight as the mixture of protein and detergent moves down a capillary filled with a hydrophilic gel buffer solution. A graph of migration time down the capillary versus absorbance by an ultraviolet detector located on the capillary has a stronger, sharper peak, making it easier to measure the purity of the protein. “It’s an improvement on an existing method used commonly,” he maintains. According to Dr. Beckman, CE-SHS will become more important as companies devote more attention to designing mAbs that have higher thermophilicity. Such mAbs, he notes, are more stable and have longer expiration dates. Ligand binding assays (LBAs) are instrumental in the drug development process to measure the immunogenicity of biotherapeutic molecules, as well as to determine drug concentrations for pharmacokinetic analyses. The robustness, accuracy, and reproducibility of these assays depends on the quality of critical reagents. Hence, careful characterization is essential for ensuring optimal assay performance is maintained over time. Best practices for identifying the physicochemical attributes of critical reagents are outlined in white paper that appeared in the AAPS Journal.1 Bio-Rad incorporates several of these in the product development and manufacturing of its anti-biotherapeutic antibody portfolio, which comprises fully human, monoclonal recombinant antibodies. As such, every new antibody is well characterized, and subsequent lots are subject to strict quality control to assess batch-to batch variability. Each new antibody is produced in three independent batches, and the activity is compared in an LBA. The batch with activity closest to the average curve is then chosen as the reference batch. Before each new production, the antibody gene is re-sequenced to ensure product identity, and prior to release, new batches are tested for specificity and purity, including size-exclusion chromatography for assessing monodispersity of full-length antibodies. Knowing the affinity of an antibody can give an indication of the sensitivity of an assay. Bio-Rad determines the affinity of all antibiotherapeutic antibodies in monovalent Fab format, which truly reflects the intrinsic antigen-binding affinity. 1. O’Hara D.M. et al. Ligand binding assays in the 21st century laboratory: Recommendations for characterization and supply of critical reagents. AAPS J. 2012; 14: 316–328. Is It Possible to Monitor Multiple Biologic CQAs within a Single Analysis? The multi-attribute method (MAM) for structural confirmation of protein therapeutics involves a targeted search of peptide-mapping data using advanced, GMP compliant–ready software, for predetermined components that are indicative of numerous critical quality attributes (CQAs). Protein sample preparation for MAM demands reproducible, fast, and low artifact–inducing proteolytic digestion into peptides; automatable methods are favored. Peptide separations must be rapid, consistent, and also free of artifacts induced through detection techniques involving intense, broad spectrum UV light. automatically detects and flags new chromatographic components in a sample once compared to a reference. with simple and familiar compliance-ready chromatography data system software, makes MAM both highly practical and desirable for GMP lab use. Kyle D’Silva, Ph.D., is pharma and biopharma manager at Thermo Fisher Scientific. 1. Grilo AL, Mantalaris A. The increasingly human and profitable monoclonal antibody market. Trends Biotechnol. 2018 June 23. 2. Overington J, Al-Lazikani B, Hopkins AL. How many drug targets are there? Nat Rev Drug Discov. 2007; 5: 993–6. 10.1038/nrd2199.